Before folding the Airgo® eXcursion, lock the Brakes by pushing down on the Brake Handles until you feel or hear the Brakes click into locked position. 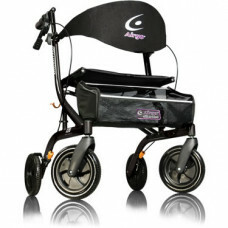 Pull the Folding Strap (G) located on the Seat to release the Safety Lock and initiate folding. 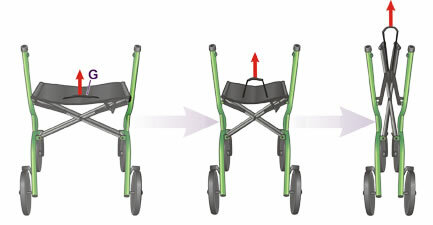 The position of the front wheels should be aligned to allow the Rollator to fold completely.